You’ve decided that a Bengal cat is the one for you! You know we’re feisty and fun, and we demand lots of attention and play, and in return we’ll reward you by putting a smile on your face each and every day…. So now you’d like to buy one, but you’re not sure how to go about it? Read on! 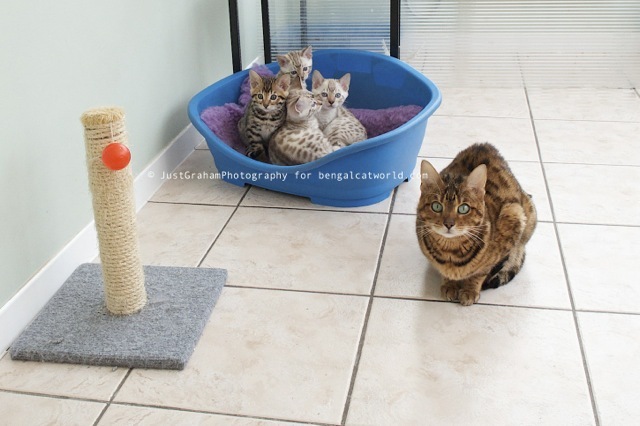 A great place to meet Bengal cats and their breeders is at a cat show. You can find out when and where they’re being held by looking at the GCCF (UK) or TICA (International) websites. Don’t be afraid to chat to the breeders and owners to get a good idea of what it’s like to live with the breed – most people are only too happy to talk about their cats! If you’ll be leaving your Bengal cat alone for long periods each day, you need to decide quite early on whether you should buy two kittens so they can keep each other company. It’s so much easier to introduce two kittens into your house at the same time, especially if they’re littermates! Some breeders also give a little discount if you buy two. Or of course you could get another breed of kitten, they don’t both have to be Bengals. Whatever you decide, if you’re getting two, you should ideally get them together or at least within a few weeks of each other, and then you won’t have to introduce the new cat to the existing cat’s established territory. Once you know how many kittens you’d like, telephone a few breeders and get an idea of prices. Then, arrange some appointments to go and see different breeders and litters, but please allow time in between visits for you to be able to have a wash and change your clothes. Never go from one breeder directly to another as this could cause cross infection which can be serious where young babies are concerned. If you’ve made an appointment and you decide not to keep it or your circumstances change, be courteous and let the breeder know. Generally, kittens that have been reared indoors are much more likely to be well socialised than those who have been kept outside in a cattery which should reduce the possibility of some behavioural problems later in life. Ask to see both the mother and father of the litter, but don’t be suspicious if the father isn’t there – breeders often use stud cats from another breeder. You should always be able to see “Mum”, however, and ideally the rest of the litter too. When meeting your potential new kitten, you should be able to handle them and make sure they’re healthy and alert. Watch for signs of sickness, diarrhoea, sticky eyes or stuffy nose. Never choose a sickly, lethargic or weakling kitten out of pity. Play with the kitten and check how it reacts. Is it playful and relaxed, or is it fearful and unused to being handled? If so, look elsewhere for a more socialised kitten. Ensure the breeder tests their breeding Bengals for feline leukaemia virus (FeLV) and feline immunodeficiency virus (FIV), along with the heart condition HCM and PKD which is a genetic disease that affects kidneys. Don’t feel rushed to make a decision. Most breeders will be happy for you to go away and think about the kitten – some will even insist on this. After all, it’s a very long-term commitment for you to provide love and care to the kitten for many years. Make sure that both you and the breeder are happy about the kitten sale. If you don’t think the kitten is what you’re looking for, don’t hesitate to say so; the breeder will then know that the kitten is still available for sale and will not be put in the position of refusing further enquiries. When you’ve chosen your kitten(s) your breeder will require a holding deposit to reserve him or her for you, and then all you need to do is wait for the kitten to be old enough to leave the breeder! Depending on the timescales, most breeders should allow you subsequent visits and you can also discuss with them the arrangements for the handover – some breeders like to drop their babies off with their new owners so they can picture where they’ll be living, others may prefer you to come and collect the kitten yourself. Whichever way round it is, the balance is usually payable at handover time. All kittens from good quality, registered breeders should be at least 12 or 13 weeks old before they leave the breeder, they should have had their full course of vaccinations, be wormed and had appropriate flea treatment, and in some cases they will be micro-chipped. In all cases you should have a written pedigree and registration documentation. Some breeders will transfer the ownership of the kitten into your name for you, but if they don’t, make sure you understand what you need to do. Many pet insurance companies now offer breeders a ‘free’ 4 weeks insurance period. Moving to a new home is a very stressful period for a young kitten, and so insurance is always welcome to overcome any problems within that period. If you and your breeder have agreed that you will collect your new fur bay, make sure you take a clean cat carrier. You should never carry a kitten unsecured nor allow them to run loose in your car! Registration/transfer slip which you and the breeder complete to transfer the kitten into your official ownership. Insurance certificate if the kitten is insured. Diet sheet outlining the kitten’s care and dietary requirements. Receipt for payment in full. Some breeders provide a kitten pack with a copy of their pedigree, toys, a sample of the food they’re used to, etc. Ask your breeder if it’s possible to have something (such as a toy or a small blanket) that the kitten has used while at the breeder’s house. This will have a familiar scent which you can use in your home to give some comfort while they are acclimatising to a new and scary (for them!) environment. It’s strongly recommended that you have the kitten checked by your own vet within 48 hours of purchase. If, for any reason, you have to part with your kitten, please do contact the breeder before doing so. Many breeders will take the kitten or cat back at any age or, if this impossible, help to find it a suitable home. Some insist that anyone who buys one of their kittens must sign an agreement that if they have to part with the kitten in future, they will contact the breeder first. How much and do they have to be spayed or neutered? My name is Leslie and I’m with Jeans Legacy Bengals. I just sort of wound up on this page and saw your question. When I looked back, I realized it was posted a year ago! Silly but I myself spent about a year and a half trying to find my first perfect kitten for me & my family. So I just thought I would check back with you anyway in case you were still looking for your furever friend. Unfortunately, my website is down right now but I would be happy to communicate with you by email. We have 4 kittens only 3 weeks old and I have 2 male littermates that are old enough to place. One is marble the other spotted. Both gorgeous with great personalities! All of my cats are registered with TICA and my cattery name is Jeans Legacy also listed with TICA. We do hope you haven’t had to wait a whole year but if you have waited that long and are still interested we would love to work with you to find the perfect fit. To answer your question though in the most general terms some breeders start out around $1,200-2,000 for a pet. But you may find some one that will sell you one for half that but if it were me I would be wary and insist on health records & see for yourself what sort of environment it came from. Also, whether or not the kitten must be spayed or neutered might be negotiated through conversations with the breeder but mostly they will insist that the kitten be altered at the appropriate age. I’m in the process of purchasing a Bengal Kitten, I wish I read this article before, but everything seems to be going in the right order. I will get the kitten at 10 weeks of age. Is this ok, or should have the breeder keep the kitten until 13 weeks as recommended. This site is awesome, thank you so much for providing the information you have. Are there any breeders in the Austin,Texas area? This has been very informative, thank you! Magnificent web site. Plenty of helpful information here. I am sending it to a few pals ans additionally sharing in delicious. And obviously, thanks for your effort! Hi. ..I have a two year old bengal Archie, who i think would benefit from a friend. Would you recommend another bengal or any other specific breed? I have no local breeders and am scared if I have another kitten shipped and they don’t get along ill have put the little guy through hell for nothing. Hello Chandra – have you seen the breeder directory we have on our site? I grew up having many cats. But I have never seen a cat like a Bengal Cat. I would like more information in this type of cat. Looking to buy a Bengal kitten.Have own 2 in the past had a F-1 and a F-3 my wife got to keep them because we didn’t want to seperate them because of our divorced. Looking for a male that has great markings. Hello Walter! I am sorry but we are not breeders and we are in the UK anyway. We hope you can find a kitten soon. Hi I don’t want a kitten but I found one in Brooklyn and I’m not selling or anything i just wanna know about it and a question I have is how much would they be worth? Cause people always gasp when I take her to the vet… So I wanna know is this a special cat or something and how much does it cost …. Hi, I have a very intelligent six year old male bengal and we thought that a friend would be good for him so put a deposit on a male bengal kitten but when we were there, we also fell in love with his sister. Do you think the sudden appearance of 2 kittens in his home would be too much for him and we’re best to stick with just the little boy or that 2 would be fine? Hi Emma! A lot depends on the purrsonalities of the kitties involved, but as long as you do the introductions slowly and patiently, there’s no reason why your existing boy will not accept two new babies. It may take several days or weeks, especially if he is very closely bonded to you. I was wondering whether you knew of any websites that had reviews of breeders throughout the US. Looking to get a bengal and have looked through various ones on the east coast on the TICA website, but it’s hard to get a feeling if there are some that people have had better experiences with. It’s great to be so thorough in your research. When we were first looking, we found it very instinctive as to which were good breeders simply by calling them and visiting the ones on our shortlist. If you have any feeling of unease at all, then don’t commit. A good breeder will also let you have contact details of others who have bought from them (assuming the previous purchasers are happy to let them do so) so you can always see how they’ve gotten along too. We’re not aware of any specific websites with reviews about breeders. Hey there. Im thinking about getting a bengal kitten but have some concerns and hoping to get some feedback. My wife and I live in a 915sqft condo and want 1 cat. Ive heard 2 cats is better but then ive seen cats from the same litter not get along at all. Im also wondering about space and time alone. Cat would be alone 8 hours 5 days a week but have someone home all the other time. And if cat trees and toys are enough for them. Look foward to hearing a reply! Hello Kyle! Spot and Lula are litter mates, as are Spike and Annie (they all share the same father too, so each pair is half siblings to the other 😉 ) They get along very well most of the time. Of course there is the odd disagreement now and again which is only to be expected. We would definitely recommend 2 if you are out for much of the working day, and if they are from the same litter, you can tell how bonded they are. They should be very bonded. Tall cat trees and toys are definitely a good idea. And also lots of interactive play with their hoomins when you are home – things like the dragonfly are a definite firm favourite with many Bengal owners. I had 2 Bengals living w/ me in my 750 sf condo for over a year, and they were fine with the space, each other, and me. I lived on the top, 4th floor, and let them out onto the deck, but they never went anywhere else outside; they also never jumped onto neighboring tree limbs, which was an initial concern. Both males, they were roughly a year apart, and played constantly – and usually slept – together, if not w/ me, though they weren’t insistent about the latter, as some cats can be. They did fine w/ my being away all day at work, and for up to 4 days for long weekends, but they did tend to chew on socks and underwear when left alone for over 2-3 days, which was no biggie; they usually went for the old stuff!. They tended to make their own toys, and loved to play fetch – and even would put their toys back in a space near their food and water when done playing! Now, THOSE are good cats! No litter problems, either. I now have 2 different Bengals, a 3 y.o. female and a 13 m.o. male, in a 2500 sf 2-story house . They’re house cats, too, but I don’t let them out onto the deck, as it’s only 10′ off the ground. These make their own toys, too, but took to a sisal scratching/perching post right away, and use it a lot. They also play well together. My only concern stems from the abusive situation they came from: a crazy old lady had 73 animals on her property, including 7 Bengals who’d never been properly socialized. I making v-e-r-y slow progress w/ overcoming their shyness, but they become more approachable every day. It’s a labor of love – and economics: I got both, shots, fixes, and all from the pound for only $64! Just two recommendations: make sure your cats have been properly socialized, or be prepared to handle that lengthy and sometimes frustrating process yourself. And, get their health histories in as great an amount of detail as you can. The breed can be subject to kidney and heart problems, as well as skeletal ones, as a good friend sadly found out with his pair. Otherwise, don’t be shy about getting two: they’ll keep each other occupied and crack you and your wife up with their antics while they’re doing so. Good luck! Hello Mike! Many thanks for sharing your experiences with us. Yes, the first few weeks of any kitten’s life is crucial and if they are not socialised properly at this age, you need lots of patience to do so when they are older. Good luck! It sounds like you’re doing all the right things. I foster kittens for an organization that rescues cats from our local shelters. Someone (God knows who) left a litter of three Bengal/Siamese cats (not sure which parent was Bengal or who had these cats). Anyway, I happen to now have one of those kittens and was wondering about what kind of shows I would be able to show him in. He looks like a Bengal while his siblings are more Siamese but he is still absolutely beautiful. Thank you! We purchased the most beautiful silver bengal kitten a few months ago – she’s currently 8/9 months old. We got her for a really good price but were warned in advance she didn’t come with pedigree papers / wasn’t certified. We met her brothers and sisters and even met her mum and dad and she is almost certainly a bengal. Firstly is there any way to prove that she is pedigree bengal and if so, can we get her certified? Regardless of the answer she is one of the best additions to our lives we ever could have imagined… playful, loving, cheeky… great! If the breeder isn’t registered with TICA or some other official body, then you will not be able to get any of their kittens registered. Unfortunately, there are no foolproof tests for determining whether or not you have a full Bengal, so you will have to rely on your instincts after seeing the rest of her family. I’m sure your instincts are correct and I hope you have very many happy years with her. I’m look for a male Bengal for my mother she had one for 11year just happened to get run over by a car but I would like to find her one please help. To check out our kitties and message us. I am looking at buying a Bengal cat. They are so cute and I’ve heard they are also quite friendly. As you said, it’s always a good idea to ask the breeder to see the parents of the litter. This can give you a good idea of how the kittens will be. Try another type of litter. Leave the cat in a smaller room to begin with. Include toys, litter box, food and water. Take it to the vet to make sure it does not have a uti or other issue. 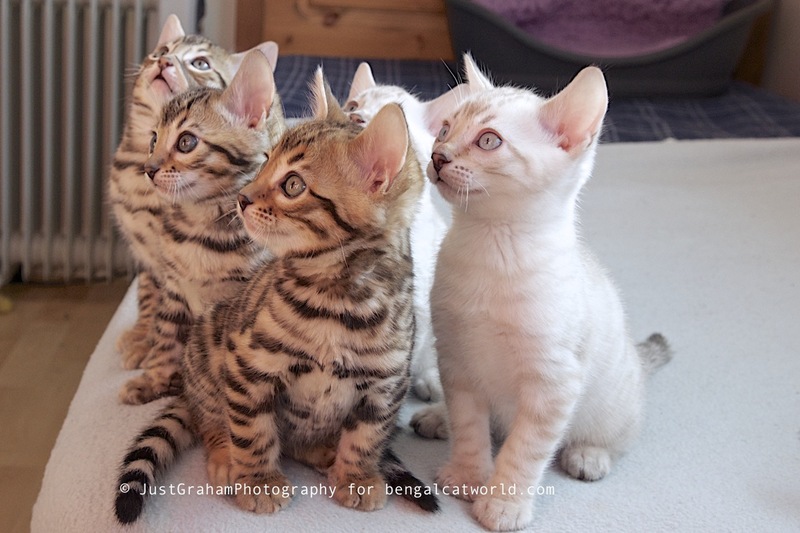 If a bengal breeder sells a bengal kitten younger than 12 w.o. avoid to deal with that breeder. No a reputable cattery does it. Hi there, we just got a Bengal cat and the breeder informed us that the Feline Leukemia vaccine can harm and possibly kill our Bengal. When we took our kitten to the vet for it’s first set of regular vaccines they were insistent that we get that vaccine. Does anyone with Bengals have any advice for us?